Check out the presidential pets below and let us know who are your favorite duo’s! 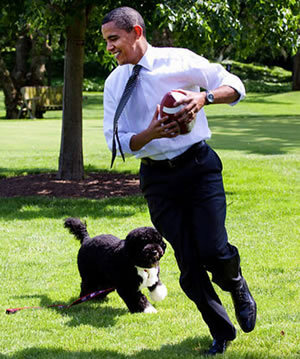 President Barack Obama, the 44th president of the United States and our current president has two Portuguese Water dogs, Bo and Sunny. Bo the older of the two Portuguese water dogs was born on October 9, 2008 and was a gift to the presidential family from Senator Kennedy. With Presidential daughter Malia’s allergy to dogs, the Obama family knew they would need a hypoallergenic breed. Bo received his name from President Obama’s two daughters, Malia and Sasha in ode to musician Bo Diddley. Sunny, the “perfect little sister for BO” was born June 11, 2012 and adopted from a breeder because according to President Obama “Bo was starting to look a little down in the dumps.” Sunny was named after her energetic and cheerful disposition. President Bill Clinton had two pets while in office, a male chocolate Labrador retriever named Buddy and an adopted stray cat named Socks. Buddy came into President Clinton’s life as a 3 month old puppy and was named after President Clinton’s deceased uncle Oren “Buddy” Grisham. It is public knowledge that Socks and Buddy were far from best friends, and were kept in separate quarters in the white house. Unfortunately upon leaving the white house, and moving into a smaller home, socks was left under the care of Clinton’s secretary as the current living situation for both pets were no longer attainable. Sadly according to the police report, on January 2, 2002 Buddy was killed by a car at the Clinton’s New York home while president Clinton was away. 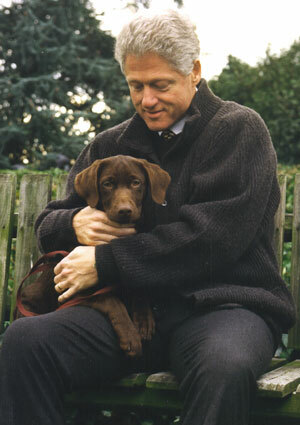 In 2005, Clinton brought Seamus another chocolate lab into his home. Mildred ‘Millie” Kerr Bush (January 12, 1985-May 19, 1997), the English Spring Spaniel of Barbara and President George H.W. 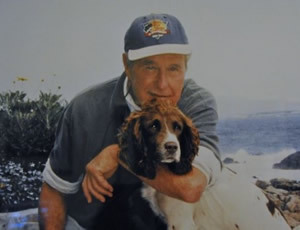 Bush, is said to be one of the most famous presidential pets. Named after Mildred Caldwell Kerr, a long-time friend of the Bushes, Millie is also the mother of another White House Pet, President George W. Bush’s dog Spot. In addition to producing White House Pets, Millie was mentioned in President Bush’s 1992 speech for re-election, saying “My dog Millie knows more about foreign affairs than these two bozos” in reference to opposition candidates at the time. Rounding out Millie’s list of accomplishments is her book, Millie’s Book: As Dictated to Barbara Bush which reached #1 on the New York Times bestseller nonfiction list. Millie died of pneumonia in 1997 at age 12. 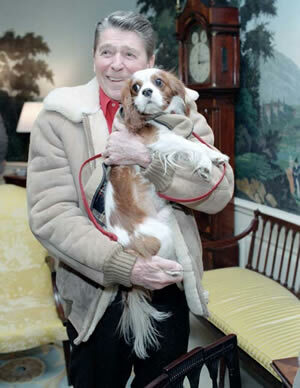 Rex (December 16, 1984-August 31, 1998) was a Cavalier King Charles Spaniel owned by Nancy and President Ronald Reagan during his term in office as the 40th president of the United States. Rex came into the Reagan’s lives when Lucky, a Bouvier des Flandres, outgrew the White House and was moved to the Reagan’s Rancho del Cielo in California. Rex moved in as a present to Nancy on December 6th 1985 and named for Rex Scouten, a White House Chief Usher. Rex gained fame after undergoing a tonsillectomy and was treated lavishly with a doghouse built by the Washington Children’s Museum which included framed portraits of the President and Nancy and included red window drapes. Rex is known to have a disliking for the Lincoln Bedroom which is said to have been haunted by the ghost of Lincoln, refusing to enter the room and would stand outside and bark through the doorway. Rex’s fame is said to be responsible for the sudden popularization of the Cavalier King Charles Spaniel in America following Reagan’s presidency. Rex lived to the age of 13 with the Reagan family until he was euthanized after developing an enlarged heart. 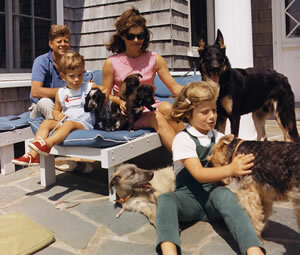 President John F. Kennedy and his family were no strangers to pets, owning five horses, five dogs, two hamsters, a rabbit, a cat, a canary and 2 parakeets. Although we would love to feature all of them, we would like to direct your attention to Pushinka. Pushinka, russian for “Fluffy”, was a mixed-breed puppy, and gift to President Kennedy’s daughter Caroline during the height of the Cold War from Soviet leader Nikita Khrushchev. Pushinka was a puppy of Stekla, a Soviet space dog that orbited the planet aboard Sputnik 2 in 1960. It is said that Pushinka arrived to the white house at six months old with her own Russian passport. Pushinka settled well in the White House, learned to climb the ladder into Caroline’s playhouse, slide down the slide and even went as far as having four puppies with Caroline Kennedy’s welsh terrier Charlie.